The corneal cross linking (CXL) procedure invented in the 1990s by Dr. Theo Siler has become widely used in many countries. Today it is not only a procedure for preventing keratoconus progression, it is also the main vision saving procedure for keratoconus, especially when performed on a young population that just started developing the disease. In the last few years the procedure had been approved by most European countries and is currently at the stage of clinical trials performed by the Food and Drug Administration (FDA) in the USA. Is this procedure sufficient for complete visual rehabilitation in keratoconic patients? In most cases, glasses and particularly specialty contact lenses are necessary. As opposed to regular contact lens wearers, keratoconic patients cannot always achieve adequate functional vision when using their spectacles and thus depend much more on their contact lenses. As a contact lens specialist in the Cornea Clinic at the Ophthalmology Department in Hadassah University Hospital, Jerusalem, I often deal with contact lens fitting for patients who have just undergone the CXL procedure and would like return to their previous contact lenses, usually RGPs. But is rigid contact lens wear shortly after the CXL procedure safe? Some studies have demonstrated a delayed epithelial healing period of more than 1 month. Will mechanical irritation caused by RGP lenses lead to recurrent erosions of weak epithelium, and can it delay epithelial remodeling in these cases? Restoration of full corneal sensitivity, reduced due to corneal superficial nerve loss, may take up to 6 months following the procedure[i]. Will this reduced sensitivity "open a window" to rigid lens induced neurotrophic corneal damage or consequent bacterial contamination? Having considered the above mentioned dilemmas, we have developed a new kind of special soft contact lens, a silicone hydrogel semi scleral lens, for patients who have just undergone the procedure. The advantages of silicone hydrogel materials are well known. High oxygen transmissibility and lower dehydration rate when compared to conventional hydrogels provide better support for normal corneal physiology. This is especially important when increased lens thickness is required. The greater stiffness of these materials provides added value to lens surface regularization properties. These lenses actually rest over the sclera and para-limbal cornea, which usually remains unchanged in keratoconus, with just a “feather” touch on the central protrusive area. Therefore, a fitting pattern that resembles a "minimal apical touch" of RGP contact lenses is achieved. The ultra-thick optical zone whose thickness may reach 0.6 mm in some cases is responsible for corneal surface regularization and consequent acuity improvement. 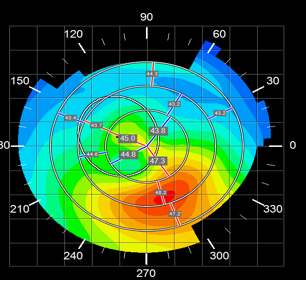 The front optical surface is aspheric to reduce possible spherical and vertical coma high order aberrations (HOAs), which are quite frequent in keratoconus. When residual astigmatism exists, a front cylinder may be incorporated into the lens design. These lenses are manufactured in Definitive (falcon V3) silicone hydrogel materials (Contamac Ltd. Saffron Walden, UK) by Soflex contact lens laboratories (Misgav, Israel). Fenestration holes located at the lens’ limbal area provide front and back surface pressure stabilization and prevent lens adhesion. These fenestrations are also thought to improve oxygen delivery, especially to the limbal area. The large diameter of the lens, about 17.00 mm in size, provides excellent centration over the cornea and makes limbal vaulting possible. The limbal vaulting zone and scleral landing zone may be individually customized by manipulating the lens periphery in order to maintain an adequate limbal clearance and to allow tears to penetrate under the lens edge (Fig. 1). An adequate amount of oxygen reaching the cornea is very important in keratoconic patients, as they rely on their lenses for most hours of the day. Despite the relatively high central lens thickness, oxygen transmissibility of the material (Dk=60, Dk/t=12) matches the criterion of 12 Fatt units set by Benjamin[ii] to provide corneal oxygenation comparable to that available in the normal closed eye. Moreover, adding fenestration holes and fluid ventilation through the lens haptic zone seems to increase the amount of oxygen reaching the cornea as well. Figures 2a and 2b demonstrate a significant regularization and flattening of the anterior surface. Moderate irregularity still remains, but the best corrected visual acuity has improved significantly compared to spectacle correction. Fig. 2b. 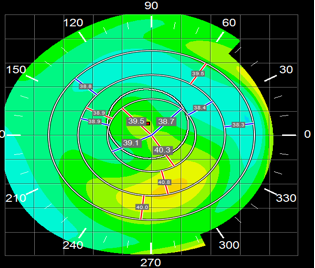 Corneal topography of the same eye with the lens in situ. Note significant central regularization and up to 8D of flattening. 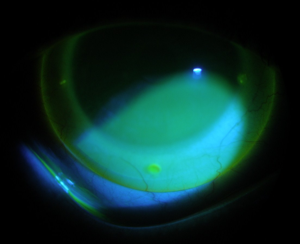 To summarize, silicone hydrogel semi scleral contact lenses can serve as a reliable addition to the arsenal of specialty lens solutions for visual rehabilitation of corneal ectasia patients, especially those that require adequate visual correction shortly after a CXL procedure. Boris received his Master of Optometry degree from Hadassah Academic College in Jerusalem (Israel). He is currently the head of contact lens service in the Cornea Clinic at Hadassah University Hospital and a consultant for the Contact Lens Clinic at St. John Eye Hospital in Jerusalem. He also runs a contact lens private practice in Jerusalem. 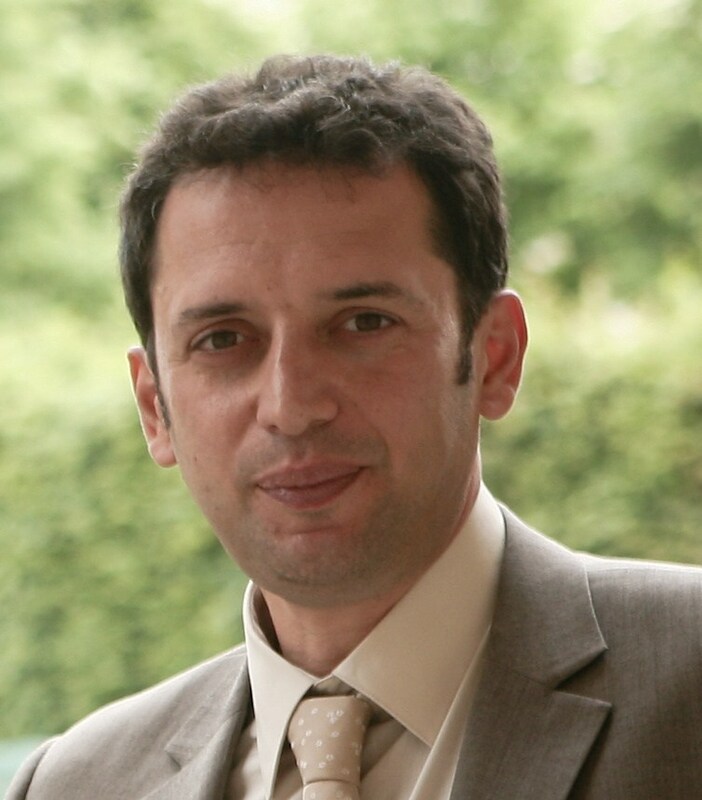 Since 2001, he has been specializing in keratoconus and scleral contact lens fitting.